Tides Marine Water Pick-Up Kits include everything needed to connect SureSeals to a point in the engine's raw water cooling system. This water is necessary for proper lubrication of the lip seal and PTFE bearing in the SureSeal housing. There are two types of kits available. 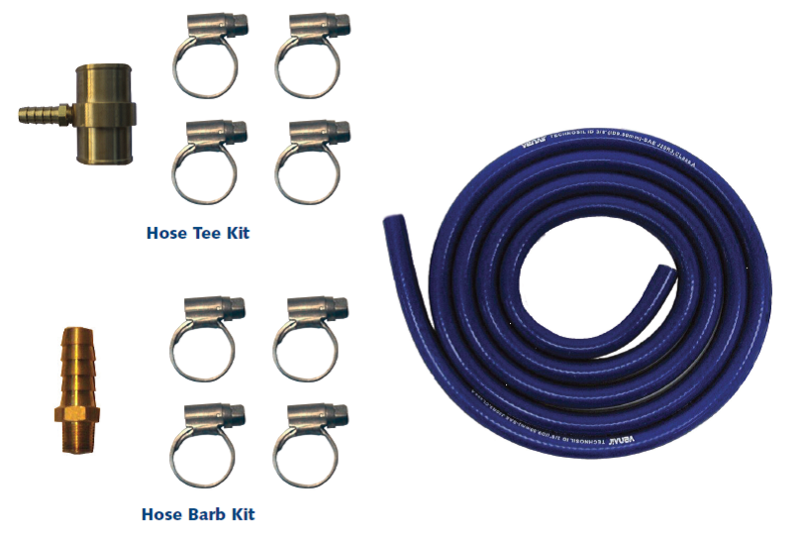 Hose Tee Kits are used to tap into flexible cooling hoses and Hose Barb Kits are used to tap into fixed points in the raw water cooling system. See diagram on the Before Ordering Page. If you plan to use a hose tee, measure the inside diameter of the hose you will be using and match it to the corresponding number in the chart on the specification page. Note the overall length of the hose tee in this chart to make sure there is enough hose available for the connection. Then, select the hose tee model with the branch fitting outside diameter that matches that of the water injection fi tting on your SureSeal. SureSeals used on propeller shafts with an outside diameter up to and including 2 3/4” will have a 3/8” injection fitting. For shafts 3” and larger, the correct injection fitting is 1/2”. If you will be using a hose barb to complete your water pick-up system, remove the plug at the point on the engine you have selected and measure its thread size. Find the corresponding thread size in the chart on the specification page and choose the fitting with the hose barb dimension that matches your SureSeal. When the engine (or engines) are located below the waterline OR water lift mufflers are installed, a vented loop may be required to prevent back-flooding of water through the exhaust system and into the engine(s). ABYC guidelines regarding vented loop materials and installation practices should be followed. The water pick-up fitting should be installed in the "pressure side" of the vented loop "T". This vented loop should be as far above the waterline as is practical (a minimum distance of 12” is required). In twin engine applications using water lift mufflers, a check valve in each water pick-up line is required if a crossover line is installed. Vented loops and check valves should be inspected for proper function at least twice a year. Read the SureSeal installation instructions provided with each SureSeal carefully before proceeding. If you have any questions, contact Tides Marine for assistance. Water Pick-Up Kits may be ordered online.